This decoration was awarded on the 15th April 1942 by King George VI to the people of Malta to 'bear witness to the heroism and devotion of its people' during the great siege it underwent in the early parts of World War Two. While Italian and German bombers brought havoc to the Maltese islands, which were at first defended notably by three Gladiators named 'Hope', 'Faith' and 'Charity', the problem of supplies was soon felt. An invasion threat in July 1941 ended in complete failure when coast defenders spotted E-boats of the [Italian] Decima Flottiglia [10th Fleet] Mas. Whilst people suffered hunger, a final assault was ordered by [German Field Marshal] Kesselring. But the people's heroism withstood every attack. On the 15th April 1942 King George VI awarded the 'George Cross' to the people of Malta in appreciation of their heroism. The Maltese Government introduced a system of honours, decorations and awards by Act XXIX of 1975. This was amended by Act XIV of 1990 which made provision for the production of National Commemorative Medals, and laid down certain limits on the number of times such medals might be struck in any period of ten years and the anniversaries that might be commemorated. The first was issued in 1992 to all those connected with the siege and supply of Malta and also to those who participated in attacks on the enemy from Malta. Source: Strickland 1992 [str92]. Awarded for acts of gallantry not necessarily in the face of the enemy, the George Cross (GC) is equal in merit to the Victoria Cross, though the latter is the senior decoration in the order of precedence. It may be awarded during peacetime to the military or civilians. Holders of the Empire Gallantry Medal at the time of the George Cross's inception (24th September 1940) had the medal exchanged for the GC. Living holders of the Albert Medal have also had their medals exchanged for the GC. The obverse is inscribed simply, For Gallantry. Principally, there are no horizontal shading marks in the background of the central medallion. 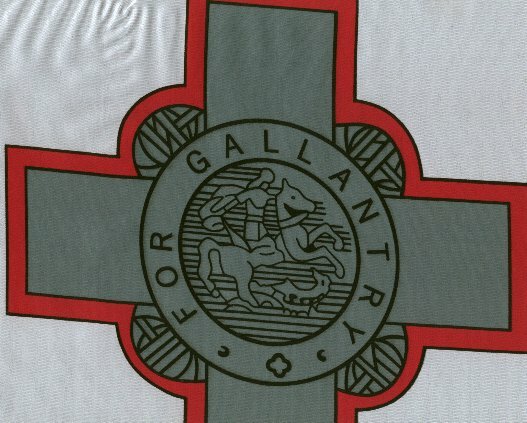 The motif at the lower centre of the inscribed ring around the St. George and the dragon, appears to be a five-petalled rose. The arms of the cross have two levels, a higher level in the centre and a narrow lower level along the outer edges. Additionally in the Instructions on the Use of Flags, the red fimbriation is much narrower. The George Cross was a decoration, second only to the Victoria Cross, instituted by George VI on 24 September 1940, replacing the Empire Gallantry Medal. Intended primarily for civilians. Awards to fighting services confined to actions for which purely military honours are not normally given. Awarded only for acts of the greatest heroism or of the most conspicuous courage in circumstances of extreme danger. Has been awarded collectively only to Malta and the Royal Ulster Constabulary. The Danish edition of Dorling Kindersley 1997 [udk97] has a yellow fimbriation to the George Cross. It is only on the straight edges (not around the cyphers), so I guess it is rather a detail of the cross than a fimbriation. In mid-September 2000 there was a picture of this part of the flag posted on the rec.heraldry list. There is no sign of anything yellow on that picture. The images currently in FOTW are based on the online version of a Maltese Government booklet (Instructions on the Use of Flags, Department of Information, 1992) and on information extracted by Maltese vexillologist Adrian Strickland from an actual copy of the book. Since it does not go all the way around the cross, but only on the straight edges, it does not really fit the term fimbriation. By the way, the Maltese Government webpage does not have a textual description of the George Cross, except in saying a representation of the George Cross, edged with red. This seems to imply proper, but which colour is an actual George Cross  does it have gilt edges, perhaps? The George Cross in the jack and air force roundel is, by the way, described as proper.